Finally! Sephora has updated its Beauty Insider VIB and ROUGE programs. Now spending hundreds (or in my case thousands) of dollars at Sephora gets you rewards really worth having. Woohoo!!! 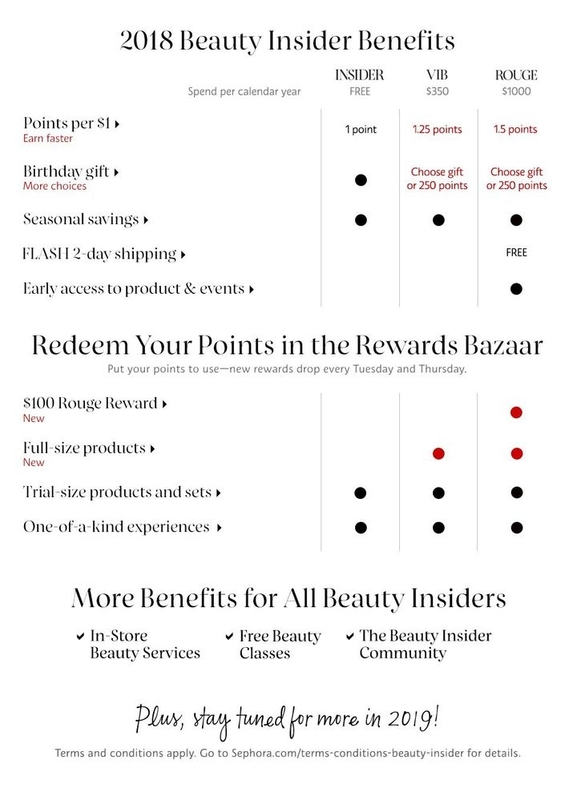 For those not in the know, the Beauty Insider Program (hereinafter, “BI”) is the free rewards program and level you can sign up for at Sephora. To reach the VIB status, you must have spent $350 at the store in one calendar year. To reach the ROUGE status, you have to spend $1000 at Sephora in one calendar year. For years all the VIBs and ROUGES were getting with their status and points were either deluxe sized samples of products or early shopping experiences (plus just a slightly higher percentage savings than the BIs). For years everyone received 1 point for every $1 spent at Sephora.com or Sephora in-store, regardless of whether you were a Beauty Insider, VIB, or ROUGE. Well, that’s thankfully over with! POINTS – VIB and ROUGE will now earn points faster. VIB members will now earn 1.25 points for every $1 spent and ROUGE members will earn 1.5 points for every $1 spent. Insider members will continue to earn 1 point for every $1 spent. REWARDS - You now get five times more rewards, including a $100 ROUGE Reward for ROUGE members and full size products for VIB and ROUGE members. CHOICES – VIB and Rouge can now choose between a birthday gift or 250 bonus points. Plus, they also have a Beauty Insider Appreciation Event going on right now where ROUGEs save 20%. Starting 8/30, VIBs will save 15% and Beauty Insiders get 10% off their orders. This is the perfect timing for all those holiday purchases we all will be making! So, are you excited for the new features of the VIB and ROUGE levels of the Beauty Insider rewards program? What is the most exciting change? Let me know below!